An absorbing first-hand account of living with bears, from the acclaimed author of The Spirit Bear. To many people, grizzlies are symbols of power and ferocity -- creatures to be feared and, too often, killed. But Charlie Russell, who has had a forty-year relationship with bears, holds the controversial belief that it is possible to live with and truly understand bears in the wild. And for five years now, Russell and his partner, artist and photographer Maureen Enns, have spent summers on the Kamchatka peninsula, located on the northeast coast of Russia, and home of the densest population of brown bears in the world. Grizzly Heart tells the remarkable story of how Russell and Enns have defied the preconceptions of wildlife officials and the general public by living unthreatened -- and respected - among the grizzlies of Kamchatka. In an honest and immediate style, Russell tells of the trials and successes of their years in the field, from convincing Russian officials to allow them to study, to adopting three bear cubs left orphaned when their mother was killed by a hunter (and teaching these cubs how to survive in the wild), to raising environmental awareness through art. Through a combination of careful study and personal dedication, Russell and Enns are persuading people to reconsider the age-old image of the grizzly bear as a ferocious man-eater and perpetual threat. Through their actions, they demonstrate that it is possible to forge a mutually respectful relationship with these majestic giants, and provide compelling reasons for altering our culture. We have been able to live beautifully with these animals, with no serious threat, because of what we've learned. Hopefully, sharing what we learn will help people -- and be a big help to our bears, too. An absolutely remarkable and well-documented account of close encounters with grizzlies. This book is a truly fascinating adventure in nature with an invaluable wealth of insider information on both bear and human behaviour. Renowned naturalist, writer and photographer Charlie Russell has extensive experience working with grizzly bears in Canada, and is the author of The Spirit Bear. With his partner, artist and photographer Maureen Enns, Russell has lived among the bears of the Kamchatka Peninsula each of the past five years. In 1997, their work was the subject of the documentary Walking With Giants. When not cohabiting with bears, Russell and Enns live in Cochrane, Alberta. For six years now, Charlie Russell and Maureen Enns have been spending summers on the Kamchatka peninsula, home of the densest population of brown bears in the world, devoting themselves to proving that it is possible to live with and understand bears in the wild. Their fieldwork is controversial yet groundbreaking, as Russell and Enns crack the mold of current research science by developing meaningful relationships with their study subjects and honouring bears as thoughtful creatures capable of communication and trust. 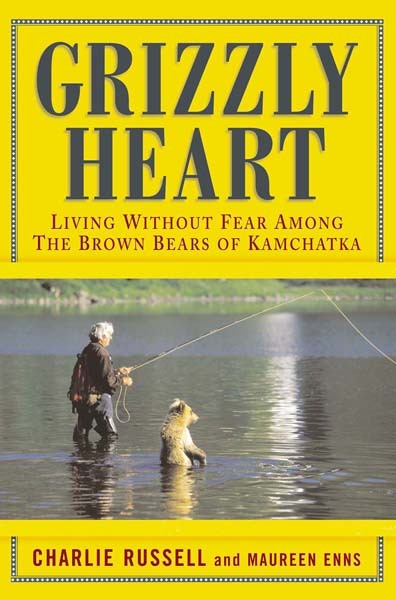 Recognizing the importance of this research and the need to expand public awareness on the issue of human-bear relations, Random House Canada is delighted to announce that we will be publishing Grizzly Heart: Living Without Fear Among the Brown Bears of Kamchatka in the autumn of 2002. An absorbing first hand account of living with bears, Grizzly Heart tells the remarkable story of how Russell and Enns have defied the preconceptions of wildlife officials and the general public by living unthreatened  and respected  among the grizzlies of Kamchatka. 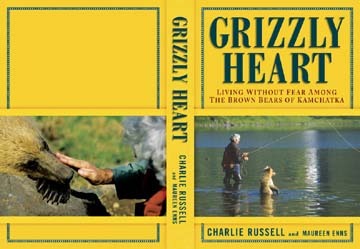 In honest and immediate prose, Russell tells of the trials and successes of their years in the field, from convincing officials to allow them to study, to adopting three bear cubs left orphaned when their mother was killed by a hunter (and teaching these cubs how to survive in the wild), to raising the environmental awareness of Russians through art. Within the book industry, Random House Canada has already received a tremendous response to Grizzly Heart. Charlie Russell is well-remembered by Canadian book-buyers and retailers for his acclaimed book The Spirit Bear, and publishers worldwide have already been clamouring for rights to publish Grizzly Heart  we have already received offers from Great Britain, Germany and the Dutch language market, and expect more to follow. Through a combination of careful study and personal dedication, Russell and Enns are forcing people to reconsider the age-old image of the grizzly bear as a ferocious man-eater and perpetual threat. Through their actions, they demonstrate that it is possible to forge a respectful relationship with these majestic giants, and provide compelling reasons for altering our culture. Random House Canada is honoured to be helping them share their story with readers worldwide.